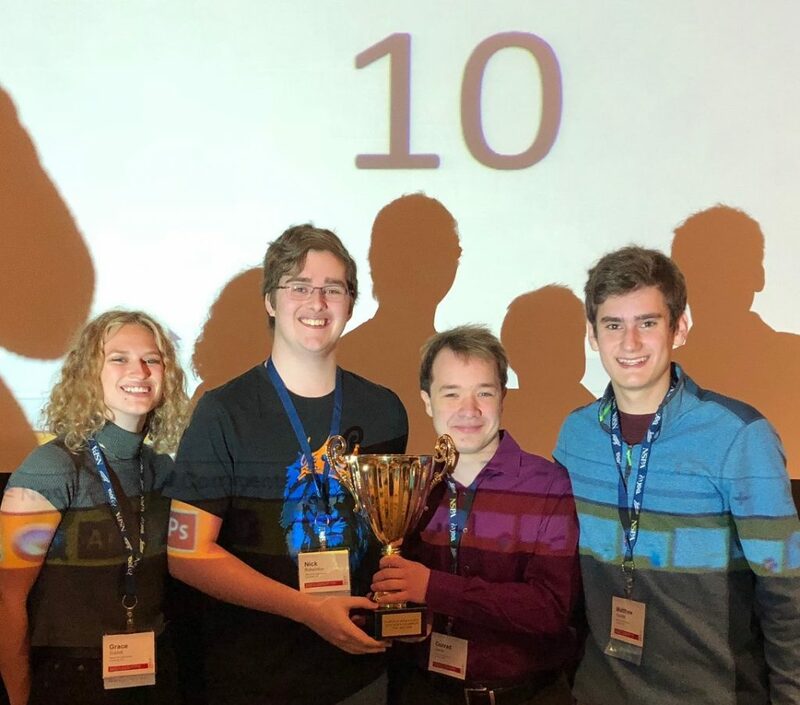 Matthew Youkilis, Nick Robertson, Conrad Kleiner and Grace Sublett, all seniors from Walnut Hills High School in Cincinnati, were named National Journalism Quiz Bowl champions Nov. 2 at the JEA/NSPA Fall National High School Journalism Convention in Chicago. Students on the winning team represented the Chatterbox newspaper staff, and each brought their own expertise to the competition. Youkilis is editor-in-chief; Robertson is deputy editor-in-chief; Kleiner is a news and features writer and Sublett is a reporter and photojournalist. The team is advised by Samantha Gerwe-Perkins, CJE. This was the Walnut Hills’ first time competing in the National Journalism Quiz Bowl. To determine the initial seeding, 39 teams of four students (of the initial 43 registered teams) took a qualifying test Nov. 1. 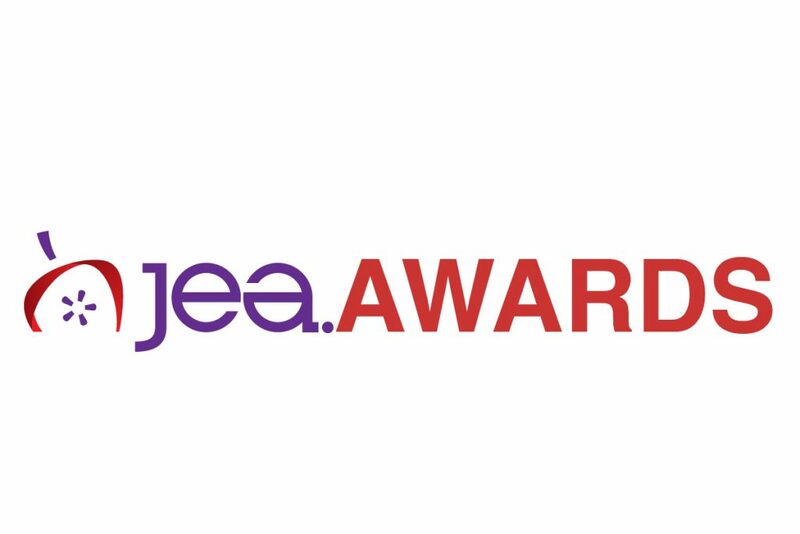 This was the largest number of entrants in the quiz bowl’s history and the second largest convention in JEA history. The next day, the top 16 qualifying teams met for four rapid-fire buzzer rounds, answering questions pertaining to current events, media law and terminology, and civics. The first team to 10 correct answers won each round. At the outset of the competition, Walnut Hills was seeded third and Cherry Hill (New Jersey) East High School — the runner-up-team — was seeded first. Both teams had multiple teams playing from their schools: Cherry Hill had three of seven teams make it to the live buzzer rounds. Both Walnut Hills teams made it to the live buzzer rounds. It was a tight race from the start with both teams playing strong throughout the early rounds. They were neck and neck most of the final round. The final score was 8-10. Gerwe-Perkins, adviser to the winning team, attributes the students’ success to their prior experience on academic quiz teams and their strong roster of AP classes, including U.S. history and government. Their school also happens to have the most winning academic quiz team in their school’s history. But ultimately, Gerwe-Perkins feels that what makes this group special is their desire to win. “They’re all really dedicated kids, and they’re very high-integrity and super passionate about everything they do,” she said.